St Thomas USVI is the lively, busy, bustling center of the U.S. Virgin Islands. It's by far the most popular destination in the islands, and boasts the most popular cruise-ship port in the entire West Indies. In the high-season, three or four cruise ships a day dock, unloading masses of passengers who swarm over the island's shopping districts, restaurants, beaches, and sightseeing attractions. And a dozen jumbo jets a day bring hordes more visitors onto the island. dotted with houses, apartment buildings, condominiums, and resort hotels. A maze of roads criss-cross the island's interior and perimeter. 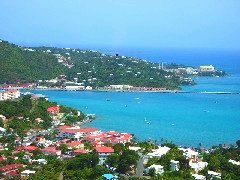 St. Thomas' main city, Charlotte Amalie (pronounced ah-MAHL-ya), is the Capital of the USVI, and certainly one of the busiest cities in the West Indies. It might be the only city in the Caribbean that has regular traffic jams! On the east end of the island, you'll find the bustling little town of Red Hook, the ferry port from which you can go to St John as well as the British Virgin Islands. But don't get the idea that you can't find peace and quiet on St Thomas. There are plenty of hotels and resorts scattered along the lovely beaches of the southeastern shore and several more on the north shore. There are also a number of hotels and B&B's on the island's mountainous, picturesque interior. St Thomas also boasts several of the finest beaches anywhere in the world. And there are plenty of places to eat. Food lovers will tell you that the selection of restaurants on St Thomas is among the best anywhere in the Caribbean. There's also plenty of nightlife, both in-town and at the numerous resorts around the island. What's more, the shopping's legendary in St Thomas USVI. The island holds the undisputed title as the shopping capital of the West Indies, with three huge, major shopping areas in and around Charlotte Amalie. As you'd expect, there's a full range of activities available on St Thomas. 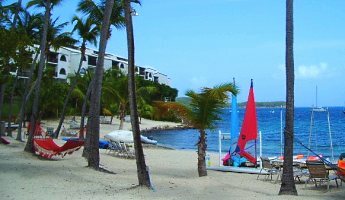 You can enjoy snorkeling and scuba-diving , sailing, windsurfing, horseback riding, tennis, golf, fishing, kayaking, and sightseeing. You'll also find spas, historical attractions, and world-class views from the island's numerous steep hilltops. The abundance of activities, attractions, and beaches makes St Thomas USVI particularly suited to families with children. All in all, there's a lot to recommend St Thomas. It's a place that has something to enjoy for just about everyone.